TOPEKA, Kan. - Authorities have arrested two men in connection with the fatal shooting of a Kansas police officer. Topeka Police Cpl. Jason Harwood, 40, was killed Sunday during a car stop in east Topeka. The Shawnee County Sheriff's Office said 30-year-old Ross Preston Lane, taken into custody on Sunday, has acknowledged some involvement in the shooting of the decorated law enforcement officer. CBS affiliate WIBW reports Lane faces capital murder, criminal distribution of a firearm and possession of a firearm by a felon charges. He is expected to be arraigned Tuesday. The sheriff's office, which is handling the investigation into Harwood's death, says a second man whom they believe might have information on the shooting was booked into the county jail Monday. The station reports Assistant District Attorney Lee McGowan said Lane shot Harwood four times before driving to another location and calling Randy Ridens Jr., who allegedly picked up the suspect on a stolen motorcycle. McGowan said the pair rode to Douglas County before the motorcycle broke down. Ridens was arrested Monday for possession of stolen property, obstruction and violation of his probation, according to WIBW. Gov. 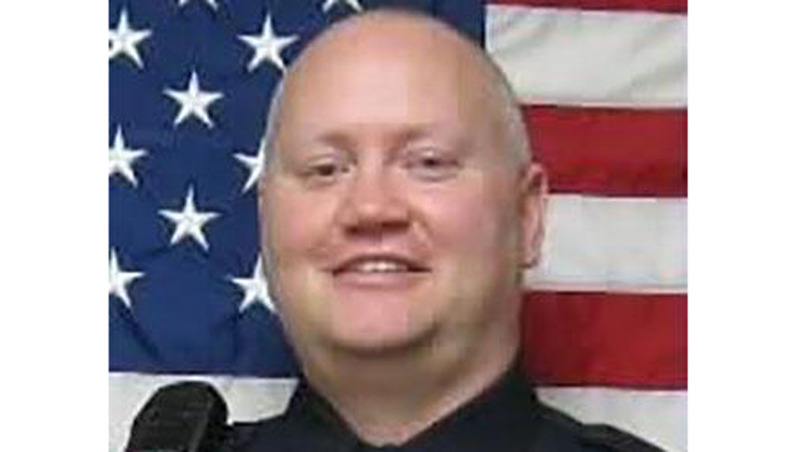 Sam Brownback ordered flags in Shawnee County to be flown at half-staff Monday and Tuesday to honor Harwood, a 15-year police veteran who leaves behind a wife and two children.